"Living Fossil" redirects here. For the story by L. Sprague de Camp, see Living Fossil (short story). The coelacanths were thought to have become extinct 66 million years ago, until a living specimen belonging to the order was discovered in 1938. A living fossil is an extant taxon that closely resembles organisms otherwise known only from the fossil record. To be considered a living fossil, the fossil species must be old relative to the time of origin of the extant clade. Living fossils commonly are species-poor lineages, but they need not be. Living fossils exhibit stasis over geologically long time scales. Popular literature may wrongly claim that a "living fossil" has undergone no significant evolution since fossil times, with practically no molecular evolution or morphological changes. Scientific investigations have repeatedly discredited such claims. The minimal superficial changes to living fossils are mistakenly declared the absence of evolution, but they are examples of stabilizing selection, which is an evolutionary process—and perhaps the dominant process of morphological evolution. tend to have little taxonomic diversity. Such criteria are neither well-defined nor clearly quantifiable, but modern methods for analyzing evolutionary dynamics can document the distinctive tempo of stasis. Lineages that exhibit stasis over very short time scales are not considered living fossils; what is poorly-defined is the time scale over which the morphology must persist for that lineage to be recognized as a living fossil. The term "living fossil" is much misunderstood in popular media in particular, in which it often is used meaninglessly. In professional literature the expression seldom appears and must be used with far more caution, although it has been used inconsistently. One example of a concept that could be confused with "living fossil" is that of a "Lazarus taxon", but the two are not equivalent; a Lazarus taxon (whether a single species or a group of related species) is one that suddenly reappears, either in the fossil record or in nature, as if the fossil had "come to life again". In contrast to Lazarus taxa, a living fossil in most senses is a species or lineage that has undergone exceptionally little change throughout a long fossil record, giving the impression that the extant taxon had remained identical through the entire fossil and modern period. The average species turnover time, meaning the time between when a species first is established and when it finally disappears, varies widely among phyla, but averages about 2–3 million years. A living taxon that had long been thought to be extinct could be called a Lazarus taxon once it was discovered to be still extant. A dramatic example was the order Coelacanthiformes, of which the genus Latimeria was found to be extant in 1938. About that there is little debate—however, whether Latimeria resembles early members of its lineage sufficiently closely to be considered a living fossil as well as a Lazarus taxon has been denied by some authors in recent years. Coelacanths disappeared from the fossil record some 80 million years ago (upper Cretaceous) and, to the extent that they exhibit low rates of morphological evolution, extant species qualify as living fossils. It must be emphasised that this criterion reflects fossil evidence, and is totally independent of whether the taxa had been subject to selection at all, which all living populations continuously are, whether they remain genetically unchanged or not. This in turn gives rise to a great deal of confusion; for one thing, the fossil record seldom preserves much more than the general morphology of a specimen—to determine much about its physiology is seldom possible. To determine much about its noncoding DNA is hardly ever possible, but even if a species were hypothetically unchanged in its physiology, it is to be expected from the very nature of the reproductive processes that its non-functional genomic changes would continue at more or less standard rates. It follows that a fossil lineage with apparently constant morphology need not imply equally constant physiology, for example, and certainly neither implies any cessation of the basic evolutionary processes such as natural selection, nor reduction in the usual rate of change of the noncoding DNA. In short, not even the most dramatic examples of living fossils can be expected to be without changes, no matter how persistently constant their fossils and their extant specimens might seem. All of these were described from fossils before later found alive (2 species, 10 species, one species, and one species respectively). Dinoflagellates include taxa that originally were described as fossils (being typified on coccoid, occasionally calcareous cell remnants: dinocysts), but now are known to include still-extant species. The fact that a living fossil is a surviving representative of an archaic lineage does not imply that it must retain all the "primitive" features (plesiomorphies) of its ancestral lineage. Although it is common to say that living fossils exhibit "morphological stasis", stasis, in the scientific literature, does not mean that any species is strictly identical to its ancestor, much less remote ancestors. Some living fossils are relicts of formerly diverse and morphologically varied lineages, but not all survivors of ancient lineages necessarily are regarded as living fossils. See for example the uniquely and highly autapomorphic oxpeckers, which appear to be the only survivors of an ancient lineage related to starlings and mockingbirds. Living fossils are not expected to exhibit exceptionally low rates of molecular evolution, and some studies have shown that they do not. For example, on tadpole shrimp (Triops), one article notes, "Our work shows that organisms with conservative body plans are constantly radiating, and presumably, adapting to novel conditions.... I would favor retiring the term ‘living fossil’ altogether, as it is generally misleading." The question posed by several recent studies pointed out that the morphological conservatism of coelacanths is not supported by paleontological data. In addition, it was shown recently that studies concluding that a slow rate of molecular evolution is linked to morphological conservatism in coelacanths are biased by the a priori hypothesis that these species are ‘living fossils’. Accordingly, the genome stasis hypothesis is challenged by the recent finding that the genome of the two extant coelacanth species L. chalumnae and L. menadoensis contain multiple species-specific insertions, indicating transposable element recent activity and contribution to post-speciation genome divergence. Such studies, however, challenge only a genome stasis hypothesis, not the hypothesis of exceptionally low rates of phenotypic evolution. ... All fresh-water basins, taken together, make a small area compared with that of the sea or of the land; and, consequently, the competition between fresh-water productions will have been less severe than elsewhere; new forms will have been more slowly formed, and old forms more slowly exterminated. And it is in fresh water that we find seven genera of Ganoid fishes, remnants of a once preponderant order: and in fresh water we find some of the most anomalous forms now known in the world, as the Ornithorhynchus and Lepidosiren, which, like fossils, connect to a certain extent orders now widely separated in the natural scale. These anomalous forms may almost be called living fossils; they have endured to the present day, from having inhabited a confined area, and from having thus been exposed to less severe competition. Elephant shrews resemble the extinct Leptictidium of Eocene Europe. A living taxon that lived through a large portion of geologic time. Queensland lungfish (Neoceratodus fosteri) is an example of an organism that meets this criterion. Fossils identical to modern Queensland lungfish have been dated at over 100 million years making this species one of the oldest if not actually the oldest extant vertebrate species. A living taxon morphologically and/or physiologically resembling a fossil taxon through a large portion of geologic time (morphological stasis). More primitive trapdoor spiders, such as this female Liphistius sp., have segmented plates on the dorsal surface of the abdomen and cephalothorax, a character shared with scorpions, making it probable that after the spiders diverged from the scorpions, the earliest unique ancestor of trapdoor species was the first to split off from the lineage that contains all other extant spiders. A living taxon with many characteristics believed to be primitive. This is a more neutral definition. However, it does not make it clear whether the taxon is truly old, or it simply has many plesiomorphies. Note that, as mentioned above, the converse may hold for true living fossil taxa; that is, they may possess a great many derived features (autapomorphies), and not be particularly "primitive" in appearance. Any one of the above three definitions, but also with a relict distribution in refuges. Some paleontologists believe that living fossils with large distributions (such as Triops cancriformis) are not real living fossils. In the case of Triops cancriformis (living from the Triassic until now), the Triassic specimens lost most of their appendages (mostly only carapaces remain), and they have not been thoroughly examined since 1938. Any of the first three definitions, but the clade also has a low taxonomic diversity (low diversity lineages). Oxpeckers are morphologically somewhat similar to starlings due to shared plesiomorphies, but are uniquely adapted to feed on parasites and blood of large land mammals, which has always obscured their relationships. This lineage forms part of a radiation that includes Sturnidae and Mimidae, but appears to be the most ancient of these groups. Biogeography strongly suggests that oxpeckers originated in eastern Asia and only later arrived in Africa, where they now have a relict distribution. The two living species thus seem to represent an entirely extinct and (as Passerida go) rather ancient lineage, as certainly as this can be said in the absence of actual fossils. The latter is probably due to the fact that the oxpecker lineage never occurred in areas where conditions were good for fossilization of small bird bones, but of course, fossils of ancestral oxpeckers may one day turn up enabling this theory to be tested. An operational definition was proposed in 2017, where a 'living fossil' lineage has a slow rate of evolution and occurs close to the middle of morphological variation (the centroid of morphospace) among related taxa (i.e. a species is morphologically conservative among relatives). The scientific accuracy of the morphometric analyses used to classify tuatara as a living fossil under this definition have been criticised however, which prompted a rebuttal from the original authors. Some of these are informally known as "living fossils". 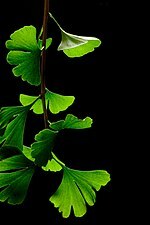 Ginkgos have not only existed for a long time, but also have a long life span, with some having an age of over 2,500 years. Six specimens survived the atomic bombing of Hiroshima, 1 to 2 kilometers from ground zero. They still live there today. Ferns were the dominant plant species in the Jurassic period, with some species, such as Osmunda claytoniana, maintaining evolutionary stasis for at least 180 million years. Sciadopitys – a unique conifer endemic to Japan known in the fossil record for about 230 million years. Taiwania cryptomerioides – one of the largest tree species in Asia. 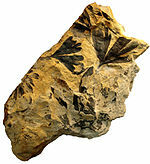 Trapa - water caltrops, seeds, and leaves of numerous extinct species are known all the way back to the Cretaceous. Nelumbo - several species of lotus flower are known exclusively from fossils dating back to the Cretaceous. Echidnas are one of few mammals to lay eggs. Hoatzin are born with two visible claws on their wings, but the claws fall out once the birds reach maturity. Crocodilians survived the K–Pg extinction event that killed off the dinosaurs. Tuataras are reptiles, yet retain more primitive characteristics than lizards and snakes. The goblin shark is the only extant representative of the family Mitsukurinidae, a lineage some 125 million years old (early Cretaceous). Pelicans (Pelecanus) – Morphology has been virtually unchanged since the Eocene, and is noted to have been even more conserved across the Cenozoic than that of crocodiles. Acanthisittidae (New Zealand "wrens") – 2 living species, a few more recently extinct. Distinct lineage of Passeriformes. Broad-billed sapayoa (Sapayoa aenigma) – One living species. Distinct lineage of Tyranni. Bearded reedling (Panurus biarmicus) – One living species. Distinct lineage of Passerida or Sylvioidea. Coliiformes (mousebirds) – 6 living species in 2 genera. Distinct lineage of Neoaves. Hoatzin (Ophisthocomus hoazin) – One living species. Distinct lineage of Neoaves. Magpie goose (Anseranas semipalmata) – One living species. Distinct lineage of Anseriformes. Seriema (Cariamidae) – 2 living species. Distinct lineage of Cariamae. Tinamiformes (tinamous) 50 living species. Distinct lineage of Palaeognathae. Nautilus retain the external spiral shell that its other relatives have lost. With little change over the last 450 million years, the horseshoe crabs appear as living fossils. Crinoids, the sea lilies, a diverse group of echinoderms known from an extensive, mostly Paleozoic fossil record. ^ a b Casane, Didier; Laurenti, Patrick (2013-04-01). "Why coelacanths are not 'living fossils'". BioEssays. 35 (4): 332–338. doi:10.1002/bies.201200145. ISSN 1521-1878. PMID 23382020. ^ Mathers, Thomas C.; Hammond, Robert L.; Jenner, Ronald A.; Hänfling, Bernd; Gómez, Africa (2013). "Multiple global radiations in tadpole shrimps challenge the concept of 'living fossils'". PeerJ. 1: e62. doi:10.7717/peerj.62. PMC 3628881. PMID 23638400. ^ Grandcolas, Philippe; Nattier, Romain; Trewick, Steve (2014-01-12). "Relict species: a relict concept?". Trends in Ecology & Evolution. 29 (12): 655–663. doi:10.1016/j.tree.2014.10.002. ISSN 0169-5347. PMID 25454211. ^ Epic Wildlife (11 August 2016). "10 Living Fossils" – via YouTube. ^ Lynch, M (1990). "The rate of evolution in mammals from the standpoint of the neutral expectation". Evolution. 136 (6): 727–741. doi:10.1086/285128. ^ Eldredge, Niles; Stanley, Steven (1984). Living Fossils. New York: Springer-Verlag. ^ Butler, M; King, A (2004). "Phylogenetic comparative analysis: A modeling approach for adaptive evolution". The American Naturalist. 164 (6): 683–695. doi:10.1086/426002. PMID 29641928. ^ Hansen, T; Martins, E (1996). "Translating between microevolutionary process and macroevolutionary patterns: The correlation structure of interspecific data". Evolution. 50 (4): 1404–1417. doi:10.2307/2410878. JSTOR 2410878. PMID 28565714. ^ Harmon, L; Losos, J; Davies, T; Gillespie, R; Gittleman, J; Jennings, W; Kozak, K; McPeek, M; Moreno-Roark, F; Near, T; Purvis, A; Ricklefs, R; Schluter, D; Schulte, J; Seehausen, O; Sidlauskas, B; Torres-Carvajal, O; Weir, J; Mooers, A (2010). "Early bursts of body size and shape evolution are rare in comparative data". Evolution. 64 (8): 2385–2396. doi:10.1111/j.1558-5646.2010.01025.x. PMID 20455932. ^ P.r. Yadav (1 January 2009). Understanding Palaeontology. Discovery Publishing House. pp. 4–. ISBN 978-81-8356-477-9. ^ a b Montresor, M.; Janofske, D.; Willems, H. (1997). "The cyst-theca relationship in Calciodinellum operosum emend. (Peridiniales, Dinophyceae) and a new approach for the study of calcareous cysts". Journal of Phycology. 33 (1): 122–131. doi:10.1111/j.0022-3646.1997.00122.x. ^ a b Gu, H.; Kirsch, M.; Zinßmeister, C.; Söhner, S.; Meier, K.J.S. ; Liu, T.; Gottschling, M. (2013). "Waking the dead: Morphological and molecular characterization of extant †Posoniella tricarinelloides (Thoracosphaeraceae, Dinophyceae)". Protist. 164 (5): 583–597. doi:10.1016/j.protis.2013.06.001. PMID 23850812. ^ a b Mertens, K.N. ; Takano, Y.; Head, M.J.; Matsuoka, K. (2014). "Living fossils in the Indo-Pacific warm pool: A refuge for thermophilic dinoflagellates during glaciations". Geology. 42 (6): 531–534. doi:10.1130/G35456.1. ^ Simpson, George (1953). The Major Features of Evolution. New York: Columbia University Press. ^ Kozack, K.; Weisrock, D. W.; Larson, A. (2006). "Rapid lineage accumulation in a non-adaptive radiation: phylogenetic analysis of diversification rates in eastern North American woodland salamanders (Plethodontidae: Plethodon)". Proceedings of the Royal Society B: Biological Sciences. 273 (1586): 539–546. doi:10.1098/rspb.2005.3326. PMC 1560065. PMID 16537124. ^ Gittenberger, E. (1991). "What about non-adaptive radiation?". Biological Journal of the Linnean Society. 43 (4): 263–272. doi:10.1111/j.1095-8312.1991.tb00598.x. ^ Estes, Suzanne; Arnold, Stevan (2007). "Resolving the paradox of stasis: Models with stabilizing selection explain evolutionary divergence on all timescales". The American Naturalist. 169 (2): 227–244. doi:10.1086/510633. PMID 17211806. ^ "The Falsity of Living Fossils | The Scientist Magazine®". The Scientist. Retrieved 2015-12-03. ^ "Diversification in Ancient Tadpole Shrimps Challenges the Term 'Living Fossil'" Science Daily accessed 2 April 2013; "The Falsity of 'Living Fossils'", The Scientist accessed 2 April 2013. ^ Friedman M, Coates MI; Coates (2006). "A newly recognized fossil coelacanth highlights the early morphological diversification of the clade". Proc. R. Soc. B. 273 (1583): 245–250. doi:10.1098/rspb.2005.3316. PMC 1560029. PMID 16555794. ^ Casane D, Laurenti P; Laurenti (Feb 2013). "Why Coelacanths are not "Living fossils" : a Review of Molecular and Morphological Data". BioEssays. 35 (4): 332–8. doi:10.1002/bies.201200145. PMID 23382020. ^ On the Origin of Species, 1859, p. 107. ^ "The University of Chicago Medical Center: Scientists find lamprey a 'living fossil' ". Uchospitals.edu. 2006-10-26. Retrieved 2012-05-16. ^ a b Herrera-Flores, Jorge A.; Stubbs, Thomas L.; Benton, Michael J. (2017). "Macroevolutionary patterns in Rhynchocephalia: is the tuatara (Sphenodon punctatus) a living fossil?". Palaeontology. 60 (3): 319–328. doi:10.1111/pala.12284. ^ Vaux, Felix; Morgan-Richards, Mary; Daly, Elizabeth E.; Trewick, Steven A. (2019). "Tuatara and a new morphometric dataset for Rhynchocephalia: Comments on Herrera‐Flores et al". Palaeontology. 62 (2): 321–334. doi:10.1111/pala.12402. ^ Herrera-Flores, Jorge A.; Stubbs, Thomas L.; Benton, Michael J. (2019). "Reply to comments on: Macroevolutionary patterns in Rhynchocephalia: is the tuatara (Sphenodon punctatus) a living fossil?". Palaeontology. 62 (2): 335–338. doi:10.1111/pala.12404. ^ Bomfleur B, McLoughlin S, Vajda V (March 2014). "Fossilized nuclei and chromosomes reveal 180 million years of genomic stasis in royal ferns". Science. 343 (6177): 1376–7. doi:10.1126/science.1249884. PMID 24653037. ^ Kazlev, M. Alan (2002). "Palaeos website". Archived from the original on 2006-01-05. Retrieved July 22, 2008. ^ Hagino, K.; Young, J. R.; Bown, P. R.; Godrijan, J.; Kulhanek, D.; Kogane, K.; Horiguchi, T. (2015). "Re-discovery of a "living fossil" coccolithophore from the coastal waters of Japan and Croatia". Marine Micropaleontology. 116 (1): 28–37. doi:10.1016/j.marmicro.2015.01.002. ^ Chambers, T.C. ; Drinnan, A.N. ; McLoughlin, S. (1998). "Some morphological features of Wollemi Pine (Wollemia nobilis: Araucariaceae) and their comparison to Cretaceous plant fossils". International Journal of Plant Sciences. 159: 160–171. doi:10.1086/297534. ^ McLoughlin S., Vajda V.; Vajda (2005). "Ancient wollemi pines resurgent". American Scientist. 93 (6): 540–547. doi:10.1511/2005.56.981. ^ "Why Is the Okapi Called a Living Fossil". The Milwaukee Journal. Jun 24, 1954. ^ "Red panda". Smithsonian's National Zoo. 2016-04-22. Retrieved 2017-05-04. Red pandas are considered by many to be living fossils. They have no close living relatives, and their nearest fossil ancestors, Parailurus, lived three to four million years ago. ^ Fordyce, R. E.; Marx, F. G. (2013). "The pygmy right whale Caperea marginata: the last of the cetotheres". Proceedings of the Royal Society B: Biological Sciences. 280 (1753): 1–6. doi:10.1098/rspb.2012.2645. PMC 3574355. PMID 23256199. ^ "'Extinct' whale found: Odd-looking pygmy whale traced back 2 million years". Christian Science Monitor. April 23, 2012. Retrieved December 19, 2012. ^ Switek, Brian (2011-03-21). "Repost: The Pelican's Beak - Success and Evolutionary Stasis | Wired Science". Wired. 152: 15–20. doi:10.1007/s10336-010-0537-5. Retrieved 2013-06-10. ^ Morelle, Rebecca (2013-06-04). "Rediscovered Hula painted frog 'is a living fossil'". BBC News. Retrieved 4 June 2013. Look up living fossil in Wiktionary, the free dictionary. This page was last edited on 22 April 2019, at 08:06 (UTC).